The national Year on Year employment to population ratio and the participation rate stopped their downward slide during the February labour market quarter and during the May quarter both were moving in a positive direction. If we smooth the original data out to a 12-month moving average we see the start of what looks like an upward turning point in the employment trends to the end of May and the national figures for June and July were reasonably encouraging. But a detailed examination of the figures by industry and occupation infer some caution should be exercised. Industry and Occupational Breakdown of National Data. By industry, over the past year, agriculture continued what looks like a long term structural decline in jobs, manufacturing showed some signs of life, but construction was still in good shape, as was hospitality. IT and Media had some short-term gains, but the only consistently strong private sector industry remained Professional Services, (such as lawyers, architects, engineers, accountants) with nearly 63,000 jobs created over the past year and 300,000 jobs in the decade since the GFC. The predominantly public sector funded or regulated industries of Public Admin, Education and Health remained the biggest drivers of jobs growth, with 45 percent of all jobs created over the past 12 months and 50 percent over the past decade. When we look at the ABS labour market table showing the narrowly defined version of public sector vs private sector for Occupations, rather than by Industry, we see 41 percent of jobs by occupation last year were created directly by the three differing levels of Government in the public sector, instead of the long-run figure of about 12.5 percent. In the private sector, 138,400 jobs were created and 74,500 were professionals, but private sector managers (and farmers) went backwards by 13,100 jobs. The hollowing out of female middle-class occupations by digital disruption continued, with 41,800 clerical and receptionist jobs going, virtually all of them full time, even as 42,200 sales jobs also disappeared. The positive figures in the private sector side of the occupation table came from the creation last year of 76,600 full-time jobs for Tradies and Technicians. There were also an extra 91,200 mostly full-time jobs for the semi-skilled and unskilled blue-collar workers (machine operators, drivers, labourers and cleaners). However, the bulk of these jobs were low paid and those that weren’t, such as Tradies, were coming off a very low base in mid-2016, keeping wages low. So where were these middle class white collar jobs lost and where were the blue-collar jobs gained? The earlier post-GFC map link and the latest map link are shown here. The online maps show the more recent national recovery in blue collar jobs seems to have also driven up employment levels and participation rates in many mixed working class and agricultural regions on the fringes of our major cities, like La Trobe – Gippsland in Victoria and Logan – Beaudesert in Queensland. In New South Wales, the formerly hard hit and relatively low SES remote and rural regions like Murray, and Far West and Orana have shown a post GFC recovery and a bounce-back of jobs under threat from technology which is supported by both the national summary data and the regional data. Well outside the capital cities, we saw a strong local recovery in the jobs market include many working-class economies which had been doing it tough in the eight years since the GFC and these include Townsville – which is genuinely heartening to see – along with other Queensland regions like Toowoomba, Ipswich, Cairns and Mackay. So, we’re seeing some growth, but from historically very low base levels. When it comes to job losses, it’s a little surprising that some of the richer inner-city regions of Sydney, Brisbane and Perth were shedding jobs in the 12 months to May 2017. After running these figures through our database for some simple correlations, we saw that the (lower SES) regions which gained the most jobs in the 12 months to May 2017 were those containing lower income, young parents, with few educational qualifications and little vocational training and living in what seemed to be often overcrowded, State rental housing, with younger children. We saw a mix of the more evangelical religions, like Seventh Day Adventist and Other Protestant, which we note often in the urban fringe seats of south east Queensland, along with Aboriginal Traditional Religions and Languages from regions like the NT Outback and Far West NSW. Those regions heading backwards during the last year were older, specifically aged from 55 years and above. They were also reasonably well off. Their residents tended to be retired, relying on superannuation and Government pensions for income. Mortgage stress made a showing here and this could be a pointer to middle class persons in their late fifties, transitioning to retirement and building up super balances to discharge their mortgage only when old enough to receive the aged pension. Finally, we should note that, while there were only small drops in the national summary figures for women in full time real estate jobs, those regions across Australia with the greatest proportion of real estate agents were shedding jobs over the past year and it was statistically significant to 99.9 percent confidence levels. The bounce back from blue collar jobs during the past year is a welcome sign of some recovery in the private sector, but strong bias towards public-sector jobs growth over the last 12 months infers that the apparent healthy recovery in the national labour market figures may not be sustained. 78,300 full time jobs were lost for Tradesmen and Tradeswomen in the past year, virtually all of them in the private sector. 65,700 of these full-time jobs lost were formerly held by Tradesmen. 55,500 full time clerical and admin jobs were lost last year. 51,400 of these were former full time jobs in the private sector and 43,800 of them were formerly full time jobs held by women. A family made up of a Tradesman dad and a mother with a clerical job makes up 22.2 percent of the workforce and 2,669,200 jobs. This is the key middle Australia voting demographic which makes or breaks Government. In terms of its percentage of the workforce, this demographic has been declining since the GFC, when it was about 25 percent of the workforce. This is why Governments representing the status quo are not getting re-elected. The private sector over the past year grew by 131,300 part-time workers, but lost 50,100 full time workers, with a net growth of 81,200 workers. This casualisation of jobs is why incomes are flat. The public sector grew 28,700 full time jobs and lost 22,600 part-time jobs, with a net growth of 6,100 jobs. So, all the growth over the past year in full time jobs has been in the public sector, with the private sector going backwards by 50,100 jobs. The big growth in high wage jobs continued among professionals where some 47,300 jobs were created in total and virtually all of them were for women employed in the private sector. There have been an extra 102,900 jobs created in past year for semi-skilled and unskilled blue collar workers, with two-thirds of them part time. Virtually all of these jobs were in the private sector. When we look at Industries, we saw a major recent jump in manufacturing jobs in the past year of more than 100,000 workers, with a similar rise for the public-sector trio of public admin, education, and health. These are the industries where the union movement still has strong representation and which support Labor or Green candidates. So, during the past year, Green voters have been travelling well in the inner cities, Labor voters (and the unions) have been doing ok in the outer industrial suburbs, but working family jobs continue to be hollowed out in the middle-class suburbs. The labour market entered a period of recovery in the 12 months leading up to the November Quarter 2015, when we compare it to the 12 months leading up to the August Quarter 2015. The jobs national labour market absorbed all new potential workforce entrants and also found jobs for some existing unemployed and hidden unemployed. This appears to have a political component with consumers driving up retail jobs. State Governments also continued hiring large numbers of health and education workers. Tourism regions gained jobs even though the industry itself grew by only 10,000 jobs. Demographically older, female Australians in traditional sea change retirement regions like Richmond Tweed or Wide Bay have seen big job gains and unemployment rate falls. Some Tasmanian regions also made an overdue recovery. Mining lost only 5,000 jobs but also seems to have exercised considerable negative leverage on jobs in mining regions in Western Australia and Northern Queensland. The big losers demographically were middle aged men in jobs at high risk of being replaced by computerisation. A serious gender imbalance is emerging with the labour market with a declining participation rate for men existing alongside record high participation rates for women. The Australian Labour market began a recovery phase in mid-2014 and this now appears to be continuing, despite fluctuations in the ABS monthly figures which now look to have been too discouraging in August and too optimistic in October and November. When we steer a middle line through these fluctuations by using a 12 month moving average of the year on year original figures, the longer term evidence is that the national labour market is now growing consistently in terms of original employment to population ratios for the first time since mid-2011. The 12 month moving average of participation rates has been moving in the right direction since mid-2014. This improvement is being led by women and according to the ABS estimates the November 2015 original participation rate for women was the highest ever recorded. This may be correct, but a more reliable estimate would halve the number of extra jobs created for women in November, compared to October. The real concern here for the November survey continues to be the flat figures for male jobs, which may be casualties of technological change, as well as stagnant demand across many traditional industries. We will review this in the full report for the November quarter over the next month, after the official figures are released. The Australian Labour market began a recovery phase in mid-2014 and this now appears to be continuing, despite fluctuations in the ABS monthly figures which now look to have been too discouraging in August and too optimistic in October. When we steer a middle line through these fluctuations by using a 12 month moving average of the year on year original figures, the longer term evidence is the national labour market is now growing consistently in terms of original employment to population ratios for the first time since mid-2011. The 12 month moving average of participation rates has now been moving in the right direction since mid-2014. This improvement is being led by women. We need to exercise caution with monthly figures in this relatively new labour market series, but it does appear that increases in confidence shown by different surveys in the new Turnbull Government, by voters, consumers and business may be paying dividends in the labour market. Signs of recovery detected in May Quarter Labour Force figures have evaporated. Year on Year figures to August Quarter and September monthly seasonal trends indicate jobs growth has slowed below the minimum required to sustain labour market growth and new jobless are sliding back into hidden unemployed. Publicly funded or regulated industries such as public admin, health and education are generating all of net jobs growth for the past year. Male participation rates have started to slide downwards again. This is of major concern. Regions faring worst over past year are those dominated by mining jobs which saw Australia through the GFC. Local informal reports from these areas say housing markets and retail sectors are in trouble. South Australian and Tasmanian economies have become basket cases. Regions doing the best and propping up national figures are led by high SES inner suburbs of Sydney, Melbourne, Brisbane and Perth. If or when the mining slump finally reaches these areas the country is in trouble. The Labour Market national summary figures look strong, but a detailed examination shows structural and demographic weaknesses. Many of the new jobs for men are part time, the figures for retail and hospitality are very soft and half of the jobs created are once again in the industries which tend to be ultimately funded or regulated by the Commonwealth – or rather future generations of taxpayers. Those who have joined the labour force in the last 12 months have usually entered through lower paying, casual jobs and this has done little to generate higher value private sector jobs outside professional services. Some higher income jobs in finance and real estate have also been lost and these seem to have impacted many families paying high mortgages with commensurately high levels of mortgage stress. At the moment with very low interest rates this has not presented as a problem, but it will if it persists through to the period when interest rates again rise to normal levels. 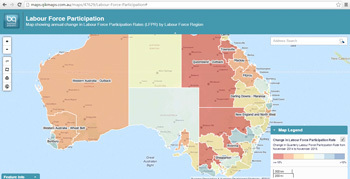 This report focuses on participation rates and the political and welfare links to participation rates across regions. It starts with tables showing the lowest and highest regional participation rates and the corresponding stereotypes for each. It continues with (green) charts based on the February Quarter 2015 Participation Rates and continues with relevant (red) charts from recent elections. This profile is based on jobs data collected by the Australian Bureau of Statistics. The primary source is the monthly Labour Force survey by Regions (6291.0.55.001), but includes national data from 6202.0, detailed quarterly data from 6291.0.55.003, earnings by industry 6302.0 Job Vacancies Australia 6354.0 and Demographic Statistics 3101.0. We have also made some use of ABS data on underemployment and labour underutilisation. As detailed data is only available in Original form, we use this, unless otherwise stated to be Trend or Seasonally Adjusted. The modelling used by ADS compares this cross section of data with our Elaborate database and uses inferential statistics to project these sample results onto all Australian postcodes and Commonwealth Electoral Divisions. Material in the ADS Elaborate database is based on data from the ABS Census, Electoral Commissions, Household Expenditure Surveys modelled by MDS Data Systems, data on home loan arrears and a wide range of published data on political and economic behaviour. According to the latest ABS labour market statistics more than 55,000 jobs have been lost in five NSW regions during the past 12 months. Comparing the Feb quarter 2014 with the Feb quarter 2015, these five regions – Richmond Tweed, Central West, Hunter Valley, Central Coast and Baulkham Hills/Hawkesbury – are the worst performing Labour markets in both NSW and Australia. The five regions contain some 19 State seats whose MPs will be determined in the NSW elections on March 28. Up to eight of these seats could change hands on March 28 and the worst performing region of Richmond Tweed contains marginal seats of Ballina, Tweed and Lismore, which are also impacted by the coal seam gas issue and strong local Green campaigns. The labour market in Richmond Tweed looks somewhat similar to the Wide Bay region in Queensland, which provided two surprise provincial city gains for the ALP in the recent January 31 Queensland poll. The excel file below provides basic labour market quarterly summaries for all Australian labour market regions – along with our region codes – and it can thus be easily resorted to for research purposes. To locate a postcode, type your postcode into the search window and hit enter. Click on the search result and the map will centre on your postcode. The search window can be accessed by clicking OPTIONS in the top left-hand corner of the map.